Donna truly loved her job, and the people she worked with. Rest in peace by sister. Please know that the family are in our prayers. R. I. P. My sister of the Badge. Thank you for your bravery, dedication to our country and the courage to make a difference. God Bless your family. God Bless and God Speed. Rest in peace sister, we'll take it from here. Thank you for your service, you will not be forgotten. God bless the family, friends, and co-workers of CBP Agent Doss during this time of tragic and senseless loss. To the family of Border Patrol Agent Donna Doss, friends, Chief of Border Patrol Carla Provost and the United States Department of Homeland Security - Customs and Border Protection - United States Border Patrol. May you Rest in Peace Mrs. Doss. It was nice working with you at the Laredo South Station. My condolences to the family and friends. Godspeed. Rest in Peace Border Patrol Agent Doss. Thank you for your service. On behalf of the Hillsborough County Sheriff's Office Honor Guard, we send our deepest sympathies and condolences. R.I.P. Border Patrol Agent Doss, may God bless you and keep you. May God comfort your family, friends and all our brothers and sisters with the United States Border Patrol. May God wrap you in his loving arms my sister and grant your family and friends strength, comfort and peace during this difficult time. We will keep you all in our thoughts and prayers my sister. Please know that you and your service will never be forgotten. Fidelis Ad Mortem my sister as we remain Standing Tall For Those Who Have Fallen. We have the watch from here. My deepest condolences to Agent Doss’ family, friends, family in green,blue and brown! Donna you will be truly missed! I’m honored to have known you! Fly with the angels as we got the watch from here! #RIP SISTER!!! Rest In Peace sister. Thank you for your service. 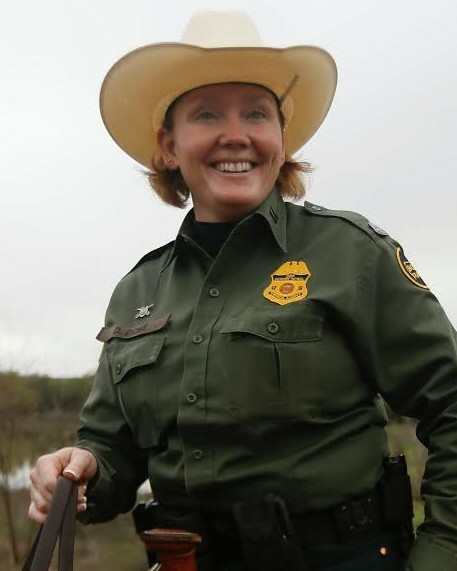 My condolences to the family and friends of Boarder Patrol Agent Donna Doss. Losing a loved one is always difficult. Please take comfort in Jesus words found at John 5:28,29 where he said that there would be a resurrection. Just think of the time when we will see our loved ones again, in paradise conditions, here on earth. Once again, I am sorry for your lost. Rest in peace Agent Doss. My thoughts & prayers are with your family, friends, and the entire USBP. Doss family and friends may God grant you all with a speedy healing. Agent Doss thank you for your Dedicated Service to your Country and to your Agency. Most of all for your Ultimate Sacrifice in the Line of Duty. Thank you for your service and your sacrifice, Agent Doss. Your service to your community will never be forgotten. Rest in Peace now, Sister. We've got the watch. Deepest Sympathy to the Family of Agent Doss and Brothers and Sisters of the United States Border Patrol. May God welcome her to the Mansion of many rooms.